Our prices are based on the work involved with planning, research and conducting your custom-made tour. Therefore, we spend a lot of time on the research and the development of itineraries, always with the goal of delivering the best possible price to our guests. Our custom tours are always unique and rarely are two tours the same, which makes it difficult to post ‘standard’ rates. For an explanation of our detailed itinerary policy please see our Detailed Itineraries. – All tour research, preparation and administration. – All transportation and mileage within the battlefield area, with professional guide(s). – Any additional mileage outside the tour boundary area. – An alternative tour vehicle, depending on the size and requirements of your group . Our quoted price does not include Flights, travel insurance, road tolls, museum entrance fees, meals/refreshments or accommodation. However we will assist you in providing travel and accommodation recommendations, when requested. There are many hotel booking sites but we have always liked https://booking.com. Your tour will be a private, personalized tour, available anytime on a first come-first serve basis, ideally for groups of 1-3 people. Our personalization service allows you to participate in the structure of your tour itinerary. If you have special requests, like following the footsteps of a particular Veteran or unit, we are happy to accommodate whenever possible. If you do have an interest in a particular soldier or unit, please provide us with his details and we will do preliminary research to make your tour an even more meaningful experience. Our tours are fully customizable and flexible. You can ‘mix and match’ to suit your own personal requirements, subject to time or budgetary constraints. For example, it is not unusual to have a customer wishing to combine a Normandy tour with a Liberation of Holland tour. Your tour options are endless. All we need to know to make your tour a reality is- what your primary interests are; how many days you have to tour, any special needs (dietary) or mobility issues; and the dates you would like for your tour. We will take it from there and organize your once-in-a-lifetime, personalized tour. Your itinerary will be very flexible and will allow you to spend as much or as little time as you choose at your specially chosen sites, so long as they are within the Battlefield tour boundaries. For many of you, this will be a pilgrimage trip of a lifetime, specially designed to suit your personal requirements and at your own pace. Once we have agreed on the outline of your tour, we will require payment to confirm your tour and dates. When payment has been received, we will prepare, with your input, if you would like to participate – a detailed tour itinerary and you’re ready to go. All sales are final. We do not have a cancellation policy, but many carriers provide cancellation coverage. We accept PayPal, Interac e-transfer, direct bank wire transfers, personal cheques or money orders. Canadian Battlefield Tours, would be honoured and pleased to make your trip a reality. 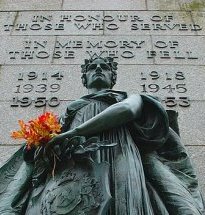 To begin your journey, go to our Contact Us page to access our online tour inquiry form or, if you prefer, send us an e-mail with an outline of your requirements to gary@canadianbattlefieldtours.ca.